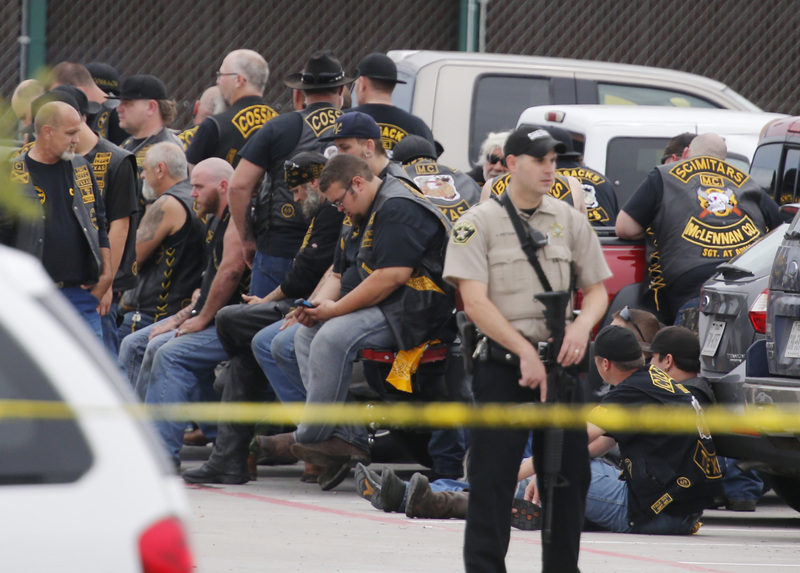 WACO, Texas -- Police said at least nine people were dead and others wounded after a fight between rival motorcycle gangs at a Texas restaurant turned into a shootout Sunday afternoon. Waco police Sgt. W. Patrick Swanton told CBS affiliate KWTX the gunfire began shortly after noon Sunday at the Twin Peaks restaurant, located in the Central Texas Market Place on Interstate 35. KWTX reported eight bikers were killed at the restaurant and one other person died at a hospital. At least 18 people were hurt, according to Swanton, none of them police or bystanders. Police initially said three gangs were involved, but later said factions from at least five gangs took part in the melee. Swanton said the fight quickly escalated from fists and feet to chains, clubs and knives before the shooting began. He described it as "one of the most violent scenes I've seen in my 34 years as a police officer in Waco." Law enforcement officers at the scene fired their weapons as well, Swanton said. Restaurant employees and other customers locked themselves in a freezer to escape the fight. Authorities later recovered more than 100 weapons. A witness told KWTX he and his family had lunch at another Market Place restaurant and were walking into the parking lot when they heard several gunshots. "We crouched down in front of our pick-up truck because that was the only cover we had," the man said, asking the station not to release his name. The witness said he saw several wounded men being treated. Trouble at Twin Peaks among rival bikers had been brewing for some time, McLennan County District Attorney Abel Reyna told KWTX about two weeks ago. Reyna said local police were on heightened alert in anticipation of trouble on Thursday nights, when Twin Peaks hosts a Biker Night. Swanton said police have been trying to work with the restaurant's management for several weeks, but have been thwarted in their efforts. "We are horrified by the criminal, violent acts that occurred outside of our Waco restaurant today," Jay Patel, operating partner of the Twin Peaks Waco franchise, said in a statement released to KWTX late Sunday. "We share in the community's trauma," he continued. "Our priority is to provide a safe and enjoyable environment for our customers and employees, and we consider the police our partners in doing so. Patel said the restaurant's management "has had ongoing and positive communications" with law enforcement. "We will continue to work with them as we all want to keep violent crime out of our businesses and community," Patel added, pledging that Twin Peaks would cooperate with the investigation. A McLennan County official said the Texas Alcoholic Beverage Commission has revoked Twin Peaks' alcohol license for seven days while the investigation continues. At about 2 p.m., a second crime scene was investigated at the Waco Convention Center, where a KWTX photographer witnessed several men being arrested. Officers also responded to the Flying J Truck Stop on Interstate 35 after a large number of bikers gathered there.